Two iconic cities, Prague and Paris, bookend this perfect journey that combines three beautiful rivers, each of which is striking in its own unique way. 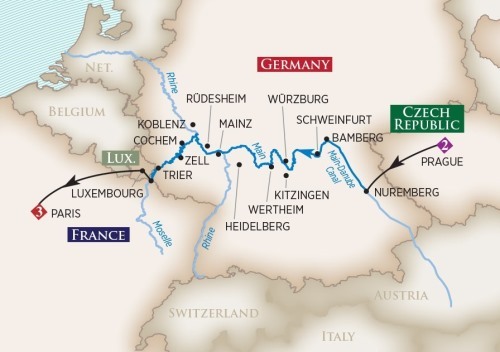 From the meandering Main to the UNESCO-designated Upper Middle Rhine Valley with its multitude of castles dotting its shores to the vineyard-clad hills of the Moselle, enjoy Europe at its most picturesque. Let the storybook villages of Wertheim, Bernkastel and Cochem captivate you. Marvel at the world's largest ceiling fresco in the Würzburg Residence and then enjoy an historic wine tasting beneath the Residenz at one of the world’s most beautiful wine cellars where you’ll taste the wine of Franconia. Celebrate with the local citizens of Zell, including Zell’s Wine Queen and Mayor, at an exclusive AmaWaterways Zell Wine Festival event—which includes live music, wine tasting and dancing. Fall under Heidelberg’s spell, perfectly nestled in Germany’s Neckar River Valley, and savor the many flavors of Germany with a chance to sample the world-famous wines of the Rheingau, the hearty smoked beer of Bamberg and Rüdesheim’s famed coffee. All along the way, gain an intimate understanding of the history, culture and culinary delights of the places you visit.